There is limited monitoring of radiation in the air, milk and water. Public access to the data is limited. In California, official near real time radiation levels close to San Onofre and Diablo Canyon are not available to the public. See California Radiation Monitors map, and EPA RADNET website and location map, and EPA radionuclide water testing requirements. Safecast operates an international volunteer public access real-time radiation monitoring. The levels are aggregated, so peak levels may not display. Individuals can purchase small monitors to help add to the public information available. Also, Solarcast stationary solar powered cellular monitors are currently in beta testing. Radiation monitors are more complicated and fragile than cell phones, so training is needed before use. Monitor must be turned off before charging. Safecast has enabled people to monitor their own homes and environments, and to free themselves of dependence on government and other institutions for this kind of essential information. However, much more data is needed. Safecast radiation maps can be zoomed in or out internationally. Turning on the satellite map option will more clearly show the location of the radiation measurement. EPA Radnet monitoring station and volunteer operator. EPA photo. The U.S. Environmental Protection Agency (EPA) provides near real time radiation monitoring information to the public on their RADNET website. See also a California display of this data. The EPA no longer monitors radiation in milk. They monitor air, precipitation and drinking water. However, monitoring is inadequate. EPA does not have a radiation monitor within 50 miles of the San Onofre nuclear plant. The closest monitors are in San Diego and Anaheim. 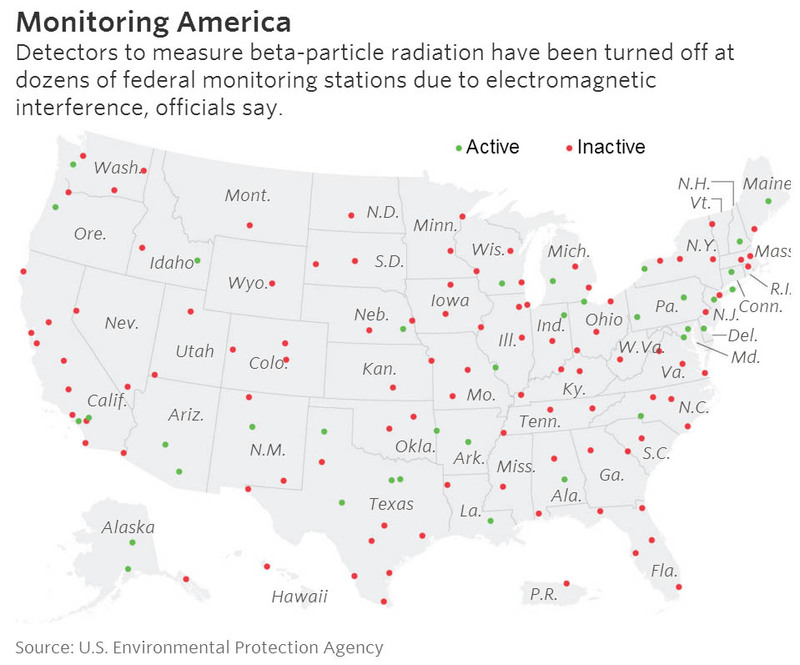 The radiation beta-particle sensors in San Diego and other major cities are turned off. The EPA has refused our requests to add a monitor in San Clemente — the closest city to San Onofre reactors. 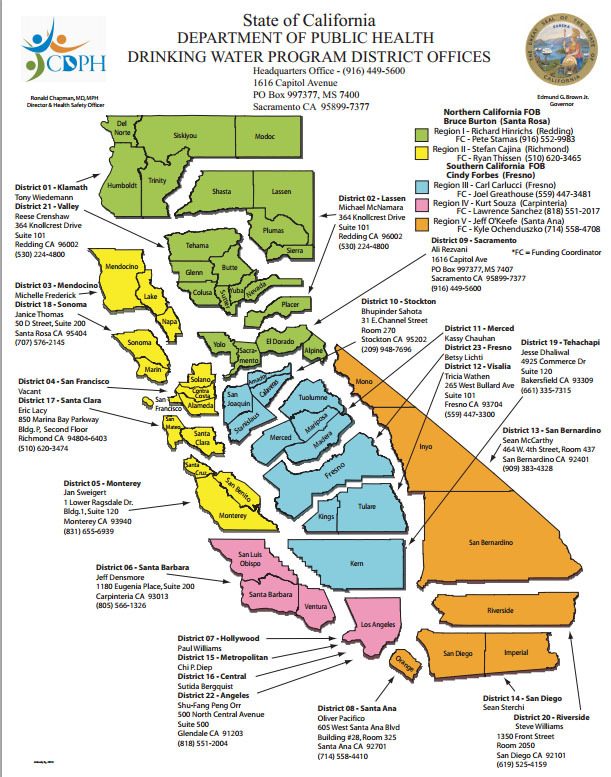 South Coast Air Quality Management District operates three of the EPA regional sites. Contact information for South Coast Air Quality Management District Governing Board and Assistants/Consultants. 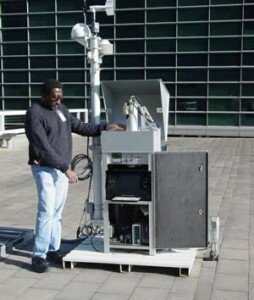 The EPA states the near-real-time [RADNET] air monitoring data are continually reviewed by computer and are “usually” posted to EPA’s Central Data Exchange website within 2 hours of arriving at the laboratory. See EPA Frequently Asked Questions link for more details on the scope of EPA radiation monitoring and areas of responsibility. The EPA provides inadequate radiation monitoring and attempts are being made to lower EPA radiation safety standards. See Dan Hirsch’s 10/31/2011 presentation to the EPA Concerns Regarding Radiation Protection Standards in a Post-Fukushima Era. The section about inadequate EPA monitoring starts on Slide 71. 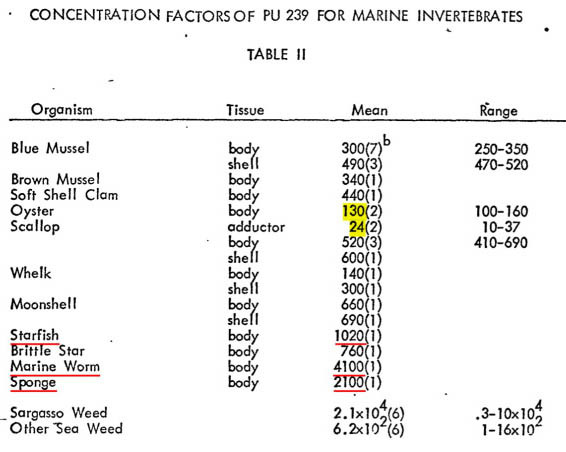 Contaminants regulated under the U. S Safe Drinking Water Act did not include radionuclides until December 2000. Chemicals used in hydraulic fracturing [fracking] are excluded from the Safe Drinking Water Act. However, the states can add regulations. California currently allows fracking with undisclosed chemicals. EPA reports show radionuclides radium-226 and 228, and strontium, as well as numerous other toxic chemicals, in hydraulic fracturing [fracking] wastewater. EPA progress report “Potential Impacts of Hydraulic Fracturing on Drinking Water Resources, December 2010, Appendix A: Chemicals Identified in Hydraulic Fracturing Fluids and Wastewater.” Radium-226 and 228 is listed on page 243 (Table A-3). Strontium is listed on page 244 (Table A-4). EPA website: Study of Hydraulic Fracturing and Its Potential Impact on Drinking Water Resources. At the request of Congress, EPA is conducting a study to better understand any potential impacts of hydraulic fracturing on drinking water resources. The scope of the research includes the full lifespan of water in hydraulic fracturing. The progress report was released in December 2012 and a draft report is expected to be released for public comment and peer review in 2014. Weaknesses in EPA’s management of the radiation network system demand attention report’s EPA’s Office of Inspector General in their 04/19/2012 report. Broken RadNet monitors and late filter changes impaired this critical infrastructure asset. On March 11, 2011, at the time of the Japan nuclear incident, 25 of the 124 installed RadNet monitors, or 20 percent, were out of service for an average of 130 days. Until EPA improves contractor oversight, the Agency’s ability to use RadNet data to protect human health and the environment, and meet requirements established in the National Response Framework for Nuclear Radiological Incidents, is potentially impaired. States may request that RadNet stations be established. See RADNET User Guide for more information. The EPA Radionuclides in Drinking Water website provides information about radionuclides in drinking water and provides guidance materials to help states and water systems comply with EPA standards. The EPA drinking water standards for several types of radioactive contaminants are: combined radium 226/228 (5 pCi/L); beta emitters (4 mrems); gross alpha standard (15 pCi/L); and uranium (30 µg/L). The California Department of Public Health (CDPH) Radiologic Health Branch (RHB) previously provided quarterly on-line radiation reports from San Clemente and eight other locations around the state, but that appears to no longer be the case. Pursuant to California Health and Safety Code section 114755, RHB conducts a small amount of routine monitoring of radioactive materials in the environment, including radioactive materials in media such as air, milk, food, and water. The results of this monitoring for the years 2011 through 2016 are available by request at environmental.radiation@cdph.ca.gov. 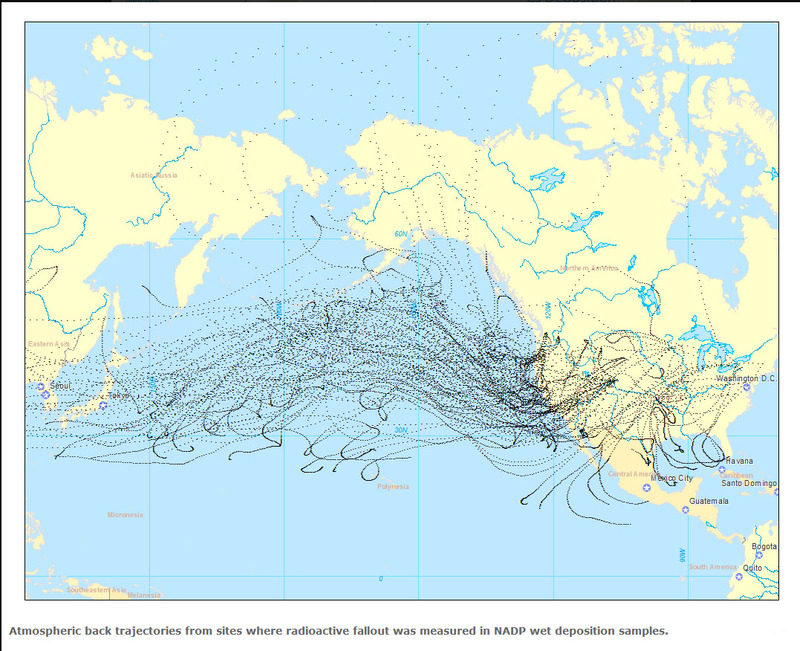 Location of California managed radiation monitors. There is no on-line monitoring capability with these old stationary monitors. Occasional air sampling occurs at the following locations within California. Filters must be removed at the site and sent to the California radiation lab in Northern California (Richmond). The information is months old and is not posted with any regularity. And the data is very limited. Their previous stated goal is to produce quarterly reports, but this is no longer provided on-line. Their current equipment does not have the capabilities to provide near real time data (like that of the EPA’s RADNET system). A Branch Health Physicist said their statutory requirement to do radiation monitoring is an “unfunded mandate”. They have a single Drinking Water and Radiation Laboratory (DWRL) located in Richmond to analyze samples for radiation. DWRL is the State’s primary drinking water quality testing laboratory and is the only State laboratory capable of measuring environmental radiation. The DWRL services the entire state, so there is no redundancy to maintain response capability in case of natural disasters or other radiological events. This indicates a possible lack of priority and preparedness for a radiation disaster. These reports used to be available on-line, but appear to no longer be on the state website. The California Department of Public Health’s Drinking Water Program (DWP) regulates public drinking water systems, but it doesn’t regulate bottled water or vended water — these are regulated as food by CDPH’s Food and Drug Branch. Southern California Edison has monitoring stations at San Onofre, but they will only share annual reports with the public. The Food and Drug Administration is responsible for testing food for radiation and for monitoring imports. Very limited data is being shared and much of it is outdated as you will see from these FDA links. The U.S. Department of Agriculture (USDA) does not monitor for radiation, but provides Food Safety Recall information and other useful information. Their FoodSafety.gov often provides useful links to other food safety related websites. The United States Department of Agriculture’s (USDA) Food Safety and Inspection Service (FSIS) is responsible for ensuring that domestic and imported meat, poultry and processed egg products are safe, wholesome and correctly labeled and packaged. However, no testing is routinely done for radiation. A FSIS Policy Development Division staff member, Dr. Harvey Hunter (on July 29, 2015), said the FSIS does random sampling for animal diseases, pathogens (human), salmonella, e. coli O157:H7, listeria and residues (e.g., pesticides in seed, herbicides, phosphates). Dr. Hunter said if there was a specific incident, such as a radioactive release from a nuclear reactor, that could trigger checking for radiation. I mentioned the on-going triple meltdown at Fukushima. He said he was not aware of any policy or any action taken by the FSIS from that incident. He referred me to the FDA, but was not personally aware of standards for radiation levels in meat and poultry or if FDA set those standards. He knew they set standards for milk and admitted if radiation was found it milk it would be in the cows (which they inspect). He said the FDA had not informed them of radiation in milk. PowerPoint presentations to promote a uniform understanding of FSIS issuances (e.g., notices and directives). The Nuclear Regulatory Commission (NRC) allows all nuclear plants to release various types of radiation every year. Nuclear reactors cannot operate without doing this. The NRC allows levels “as low as reasonably achievable” — not what is safe. The NRC relies upon self-reporting and computer modeling from reactor operators to track radioactive releases and their projected dispersion. A significant portion of the environmental monitoring data is extrapolated – virtual, not real. The NRC does not provide current radiation data to the public and has refused to do so. Commissioners tell us to look at the annual reports. See details on request to make radiation visable, presented to 4 of the 5 NRC Commissioners, 3 EPA Radiological Directors, and Senate Committee staffers in January 2014. Download or print copy of the request. See San Onofre 2010 Annual Radioactive Effluent Release Report and the 2010 Annual Radiological Environmental Operating Report. For other radioactive effluent release reports and more information, go to the NRC Effluent Release Reports website section. 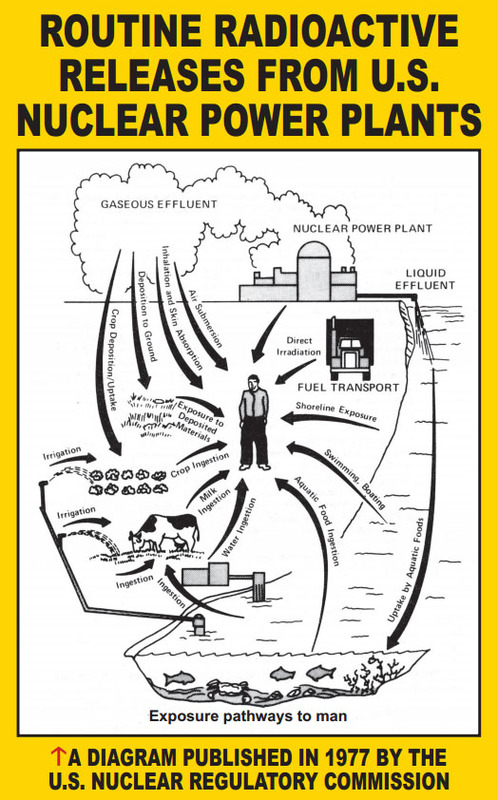 See Beyond Nuclear handout “Routine Radioactive Releases from U.S. Nuclear Power Plants“. The NRC acknowledges underground pipe radiation leaks that cannot be inspected. See Radioactive leaks found at 75% of US nuke sites. Nevada has a Community Environmental Monitoring Program (CEMP). It is a network of 29 monitoring stations located in communities surrounding and downwind of the Nevada National Security Site (NNSS), formerly the Nevada Test Site (NTS), that monitor the airborne environment for manmade radioactivity that could result from NNSS activities. The CEMP is a joint effort between the Department of Energy’s National Nuclear Security Administration Nevada Site Office (NNSA/NSO), and the Desert Research Institute (DRI) of the Nevada System of Higher Education. The network stations, located in Nevada, Utah, and California are comprised of instruments that collect a variety of environmental radiological and meteorological data. To manage the stations, DRI employs local citizens, many of them high school science teachers, whose routine tasks include minor maintenance of the equipment, collecting air filters and routing them to DRI for analysis. These Community Environmental Monitors (CEMs) are also available to discuss the monitoring results with the public, and are available to speak to community and school groups. Program funding and equipment are provided by NNSA/NSO. DRI manages the program, provides technical direction, employs and trains CEMs, conducts public outreach activities and collects data to be analyzed by an independent laboratory. See also Jeff McMahon’s Forbes article Citizen Monitors Keep A Wary Eye On Radiation And Government. HANDOUT: Please share this one page fact sheet on California Radiation Monitoring with your elected officials and ask their support to improve radiation monitoring in California. Guidance for Radiation Accident Management has radiation measurements, conversions and related information. San Clemente is the closest city to San Onofre. Public near real-time radiation monitoring in San Clemente would benefit all of Southern California. However, it does not exist. And San Onofre has refused to share current data with us. Repeated requests to the San Clemente City Council for help obtaining near real-time radiation monitoring for the public have been rejected or ignored. See February 7, 2012 letter to San Clemente City Council. The County of San Diego Radiological Health Program (Community Health Division) participates in emergency preparedness planning for the San Onofre Nuclear Generating Station & the Off-site Dose Assessment Center. And San Diego County is one of the few local agencies designated by the Department of Health Services to conduct radiation inspection. San Diego State University purchased a RADNET monitoring station. However, they are not sharing data with the public, according to this HI-Q Environmental Products Company July 25, 2012 press release. 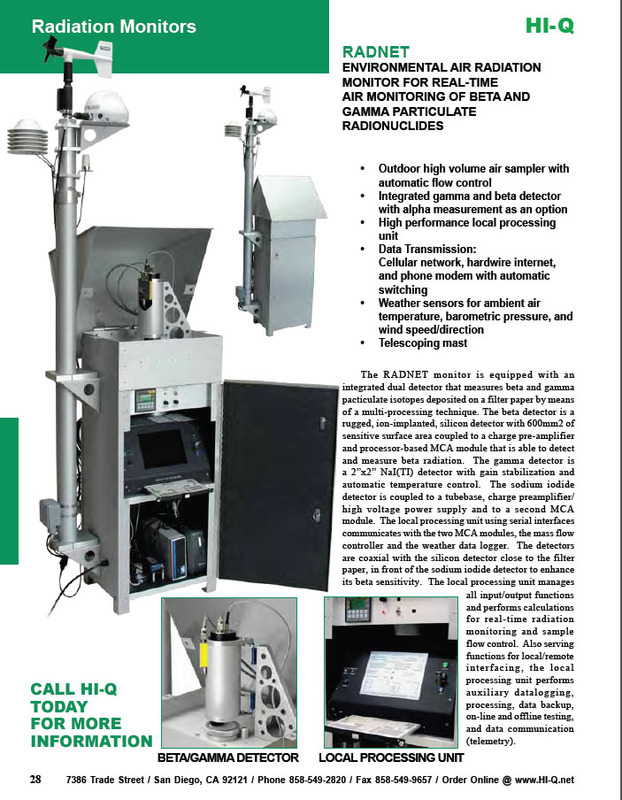 For more information about the RADNET equipment, see Page 28 of HI-Q Catalog. 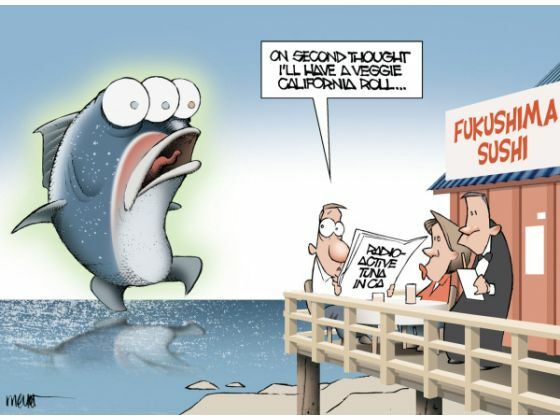 San Onofre Unit 3 had a radiation leak on 01/31/2012. NRC Management Directive 8.3 (2/16/2012) states the leak amount is an “estimate” (page 6 of Decision Document form). This brings into question the accuracy of the data we are receiving from San Onofre. 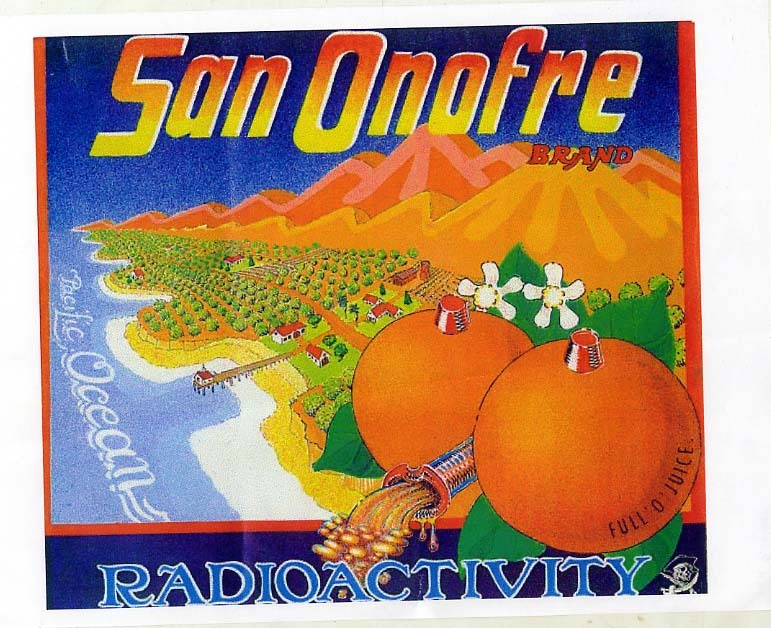 San Onofre releases radioactive tritium in the ocean and ground. 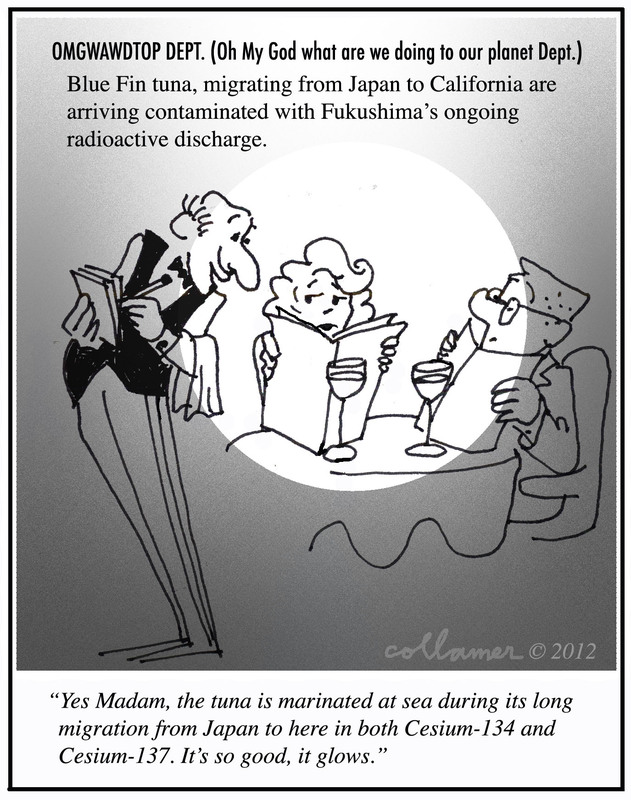 For more information about tritium click here. Radiation Types and Risks: For information on types of radiation and health risks, click here. 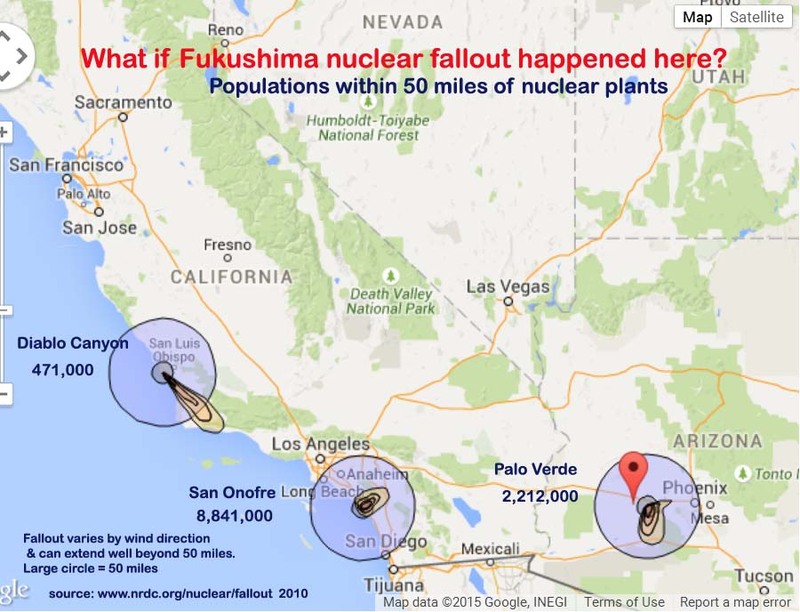 What if the Fukushima nuclear radiation fallout happened in the U.S.? These radioactive plumes from severe nuclear accidents were calculated by NRDC based on the actual weather patterns of March 11-12, 2011. The result on any given day will vary according to the type of reactor accident and on the prevailing weather patterns at the time. These plumes artificially extend only to 50 feet. Winds can carry them further. See NRDC interactive U.S. map. How Citizen Scientists can Sample Radiation – Fairewinds Video. These maps show government and scientific data of Fukushima radiation fallout into North America from March 8th, 2011 to April 5th, 2011. This represents less than one month of data and includes limited monitoring sites. Radiation fallout continues from Japan’s Fukushima nuclear power plants, yet there seems to be a lack of priority and resources dedicated to informing the U.S. public about the risks. Atmospheric back trajectories from sites where radioactive fallout was measured in NADP precipitation samples. 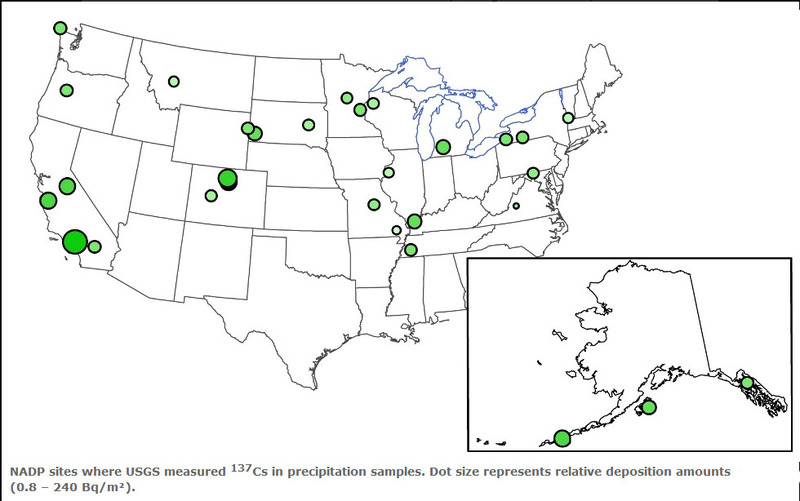 NADP sites where USGS measured Cesium-137 in precipitation samples. Dot size represents relative deposition amounts (0.8 – 240 Bq/m2). The U.S. Geological Survey (USGS) in collaboration with the National Atmospheric Deposition Program (NADP) monitored North American precipitation samples for the presence of nuclear fallout after the 3/11/2011 Japan Fukushima Daiichi nuclear disaster. Specifically, excess precipitation and filtrate (insolubles suspended in precipitation) from National Trends Network sites and selected Mercury Deposition Network sites were analyzed for the presence of radiological fallout for samples collected during the 3/8/2011 to 4/5/2011 sampling period. NADP samples were provided to the USGS’s TRIGA Nuclear Facility in Denver Colorado, where the radiological determinations were made. Detections and measurable fallout from wet deposition was observed primarily at NADP sites located along the West Coast of the US, the central Rocky Mountain region and northern Great Plains, the central and upper Mississippi River Valley and eastern mountainous regions ranging from Virginia northward through Vermont. Deposition was also observed at NADP sites in Alaska (see figure). North America’s West Coast is projected to be the most contaminated by Fukushima cesium of all regions in the Pacific within 10 years — “An order-of-magnitude higher” than waters off Japan. See report: Model simulations on the long-term dispersal of Cesium 137 released into the Pacific Ocean off Fukushima. Testing radiation levels in the ocean food chain may be more useful than testing ocean water.